Learn about the temperament and personality of the Welsh Springer Spaniel. Discover what he's like to live with, his traits and characteristics and how he generally behaves. And look at lots of Welsh Springer Spaniel photos. The Welsh Springer Spaniel makes an excellent companion for both families and hunters. He is merry, active, affectionate, gentle, loyal and loving. He is also impulsive, mischievous, and incredibly stubborn. The "Welshie" is a "Velcro dog." He will stick to you and follow you everywhere you go. You will never go anywhere alone again, and that includes the bathroom. He is demanding of your attention and loves to be with his people. He wants to know what is going on at all times. He does not do well if left alone, and is prone to separation anxiety. This is a high (or very high) energy dog. The Welshie can run all day. They need vigorous daily exercise: both physical and mental. They do best with a fenced-in yard, but beware: they can often climb fences. In addition to climbing, they love to jog, run, hike, and swim. Not only are they excellent working dogs, but they also enjoy obedience, tracking, retrieving, and agility. A bored Welshie can get destructive and noisy. A Welshie will also bark if he wants to call your attention to something that they think you should be aware of. They will bark at a lost potato chip until you move the couch so that they can get to it. They will certainly alert you if someone is at the door. They are reserved with strangers, but rarely show aggression toward them. Welshies are almost always friendly toward other people and dogs, and do very well with respectful children. Welshies are intelligent and benefit greatly from obedience training and respond very well to it, especially if started at a young age. They often counter surf. They want to please you, but are easily bored and easily distracted. They love to know what is going on outside, whether they have to spend all day standing on their hind legs, or pushing their nose up against the sliding glass door. These strong, devoted, entertaining dogs will keep you busy. They love to "play" in the garden. They also love to play in the water, whether it's the ocean, swimming pool, or mud puddle. In everything they do, Welshies celebrate life. 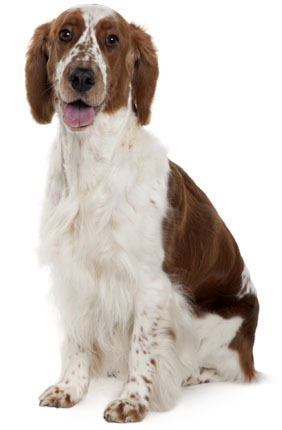 The Welsh Springer Spaniel is intelligent and quite easy to train. He learns new commands quickly at an above average rate. The Welsh Springer Spaniel sheds a fair amount of hair. You'll find hair stuck to your couch, carpets, clothes and everything else in your home.